Afternoon volunteers should join their team at the lunch site prior to working for the afternoon. 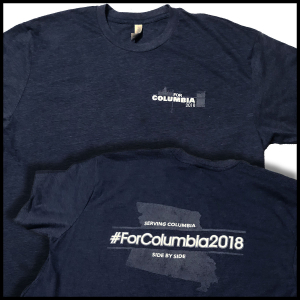 One of the ways ForColumbia strives to love and serve our neighbors is by serving those who are actively working every day in the lives of people in Columbia. St. Francis House is a Catholic Worker House that provides a home for those who are homeless, offering food, shelter and basic necessities for men. Opened more than 30 years ago, this safe haven is run completely on private donations and the willingness of individuals to live in the home and act as “house managers.” These selfless individuals do a lot of good with very little. This is why we believe your day will be well spent serving at St. Francis House. installing floating flooring in the dining room and kitchen area. ForColumbia will provide all paint supplies and flooring materials. We encourage all volunteers to bring tools they have on hand that would be helpful to this work.